GUION (Guyon), FRANÇOIS, privateer operating on the coasts of Acadia and New England; b. 3 March 1666, son of Denis Guion and Élisabeth Boucher of Île d’Orléans; married Marie-Anne Roberge, 4 April 1688; d. before 12 July 1701. Guion is mentioned several times in Robinau* de Villebon’s journals, sometimes in association with another privateer, Baptiste (Pierre Maisonnat), but the name François is used there only once. References to Guion the elder and Guion the younger have increased the difficulty of identification, as have the numerous repetitions of similar names in the Guion family. Webster stated that Guion was born in 1635, but this seems to be the birth date of an uncle of the same name. C. Alice Baker completely confused Guion with Baptiste. Two notarial documents have been found, however – one of them Guion’s marriage contract and the other referring to the sale of prizes – which bear identical signatures of François Guion, and enable us to identify him as the man born in 1666. Guion was a brother-in-law of Antoine Laumet, dit de Lamothe Cadillac, who married the former’s sister Marie-Thérèse, but not of Louis Damours de Chauffours and Mathieu Damours* de Freneuse, as Antoine Bernard has stated. They married two of his cousins. Guion’s younger brother Joseph sometimes accompanied him as his lieutenant and sometimes operated separately. They were among those referred to by Bernard as “sea-wolves,” who were based at Port-Royal (Annapolis Royal, N.S. ), Beaubassin (Chignecto) and Les Mines (Grand Pré, N.S.) at this time and who preyed on English shipping, especially fishing boats. On 4 June 1695 François Guion took three prizes from an English frigate which went on a rock south of Grand Manan, and by September of that year he had captured nine more fishing vessels, five of which he ransomed for 1,500 livres. As Guion’s home was in Quebec he took many of his prizes there for disposal, and there is a record of his brother Joseph’s recruiting there in 1695 for the crew of François’ sloop Philibusquier. In April or May 1696 Guion’s vessel was captured by an English frigate and he was taken prisoner to Boston. 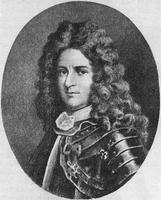 He was soon released in an exchange for English prisoners taken by Pierre Le Moyne d’Iberville at Pemaquid. 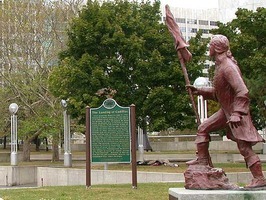 He was back at Port-Royal in late summer bringing word that an English force was being assembled at Boston for an attack on the French settlements, especially Villebon’s Fort Saint-Joseph (Nashwaak) on the Saint John River. Nothing more seems to be recorded about Guion’s activities after this date, but his career was a brief one for, according to Tanguay, he was already dead when his fifth child was born in July 1701. As his wife requested an inventory of his estate in August, it is probable that Guion had died shortly before the birth of his last child. AJM, Greffe de Michel Lepallieur de Laferté, 19 janv. 1702. Coll. de manuscrits relatifs à la N.-F., II, 222, 250, 282. Jug. et délib., III, 513–16. NYCD (O’Callaghan and Fernow), IX, 617, 643, 667. A. Roy, Inv. greffes not., VII, 51; XVIII, 191, 322. P.-G. Roy, Inv. testaments, I, 274. Webster, Acadia, 77–78, 81, 82, 148, 149, 150–51, 178. Tanguay, Dictionnaire, I, 296. Bernard, Le drame acadien, 189, 220. C. A. Baker, “The adventures of Baptiste,” Pocumtuck Valley Memorial Assoc. Hist. and proc., 1899–1904, IV (Deerfield, Mass., 1905), 342–477. Régis Roy, “Le flibustier Baptiste,” BRH, V (1898), 11–12. See also É.-Z. Massicotte, “Flibustiers montréalais,” BRH, XLII (1936), 583–84. W. Austin Squires, “GUION, FRANÇOIS,” in Dictionary of Canadian Biography, vol. 2, University of Toronto/Université Laval, 2003–, accessed April 22, 2019, http://www.biographi.ca/en/bio/guion_francois_2E.html.